many of whose members continue to cling to belief in Rossi's "technology" despite the fact that it increasingly bears little or no resemblance to any other LENR systems. The initial versions were similar to other cold fusion claims such as Arata's, which is why they seemed plausible to me and others. The latest ones are powered by Dancing Puppets, I'm told. As you say, they bear little or no resemblance to LENR, or anything else. They are sui generis. Agreed IO. I did however not really leave it out, it comes under (1) He is very good at choosing a pitch, and choosing his audience. Slight correction: Alan here claims to have systems that look like what Rossi used in the Lugano tests doing extraordinary (= LENR, in the field's "anything inexplicable can be explained by LENR" way) things. So that is a resemblance between what are called LENR systems and Rossi's stuff and one that might incline people like Alan, who (AFAIK) thinks his system exhibit profoundly anomalous behaviour indicative of some nuclear reaction, to give credence to Rossi's stuff. Personally, I'd prefer a much narrower definition of LENR (which would not include Rossi's stuff) but that is irrelevant. I can't say that his current systems work or not: there's no proof one way or the other. And I'm every bit as fed up with his puppets as everyone else. But if his current systems do work, they utilize the negative resistance regime of an electrical discharge (between the regular glow discharge and positive resistance arc discharge) which produces ion acoustic oscillations. These oscillations were present on the oscilloscope during the presentation of the QX in Stockholm. Of course just because the oscillations were present it doesn't mean the system was necessarily doing anything anomalous. However, so many different systems claiming exotic effects (excess electricity, excess heat, weird emissions) utilize this zone - including Black Light Power's Suncell - that I think there's a chance the device was producing some level of anomalous heat. But we'll never know because his presentation of the QX was so bad and now he's turned the E-Cat saga (which already had a sleazy side) to a pathetic cartoon. I'll also say that it does seem like the basic concept of the QX does roughly resemble some other devices that utilized the negative resistance zone to produce anomalous effects including some of Alexander Chernetsky's devices. If Rossi was using a sharp tip or hollow cathode, I'd say the setup could resemble an extreme modification of a Kenneth Shoulder's style EVO generator. Interestingly, I don't think Kenneth Shoulders ever attempted to produce a resonant system with a power supply that could be tuned to allow a complex space charge construct or "macro EVO" to self sustain. If Rossi has anything with the QX and SK, he's done a great job of screwing over the entire community so that devices that take advantage of the negative resistance regime will look kooky and won't likely be replicated. Once again, he puts his wish for absolute and total control over his technology before the entire field and the entire planet. However, so many different systems claiming exotic effects (excess electricity, excess heat, weird emissions) utilize this zone - including Black Light Power's Suncell - that I think there's a chance the device was producing some level of anomalous heat. 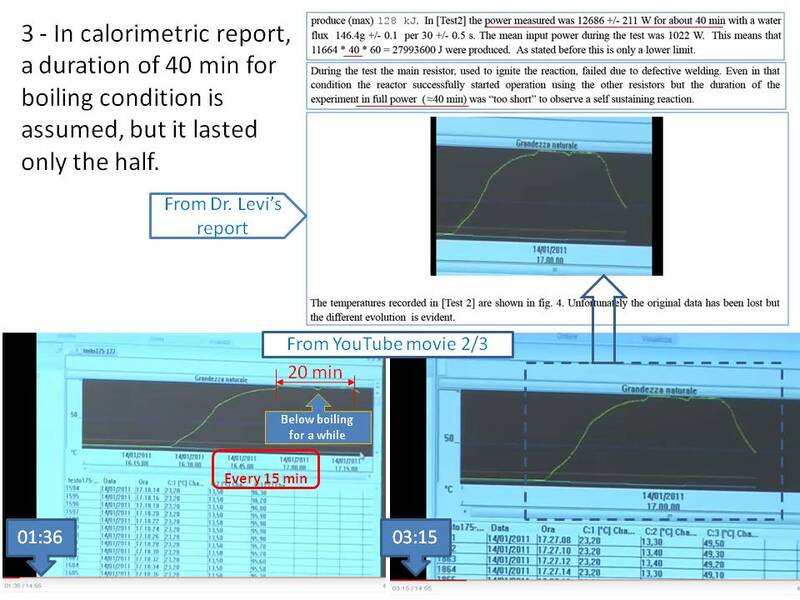 An alternate explanation for such a suspicious set of anomalous results (taking your observation as correct) is that the plasma oscillations, which cause large EMI, interfere with measuring equipment to make false positive results common. Rossi's considerable appetite for hard work at the lab bench is well known. Apart from different designs, heater and measurement systems, different metallic fuel, deuterium not hydrogen, they are very much like Rossi's Lugano experiment. 1b : Water flow : the diaphragm pump used has the same properties as the Prominent -- at very low head the actual output is much greater than the rated output. They measured the ACTUAL flow. I agree that the first Levi paper was mistaken. I think the second Levi paper might have merit, but the third one went back to being wrong. An author can be wrong the first time, and right the second time. Yes, it can happen and it's much more likely than the other way round, but in science it's not enough. On the contrary, it is expected that before or during the issuance of the second (hopefully) right paper, the authors recognize that the first paper was wrong and explain the reasons in a way so convincing as to dispel any doubts about a possible intentionality of the misrepresentations contained in the first report. In the absence of this recognition and explanation, no further report issued by the persons involved in a first wrong paper should have been taken into consideration. Rossi's original ecats were rusty junk, the most prominent feature of which were two relatively huge heaters, including one that heated only the coolant fluid. Wonderful design. And then there was one easily misplaced thermocouple and an exhaust hose claimed to put out a lot of dry steam but which obviously didn't. That is really how other cold fusion claims went? What does Rob do / investigate? As for the absence of water overflow, how can you say so? I would make you notice that, contrary to the previous test held on December 2010, when the water hoses were transparent, the outflow water hose used in the January 2011 demo was a black opaque one (1a). Wonder why. 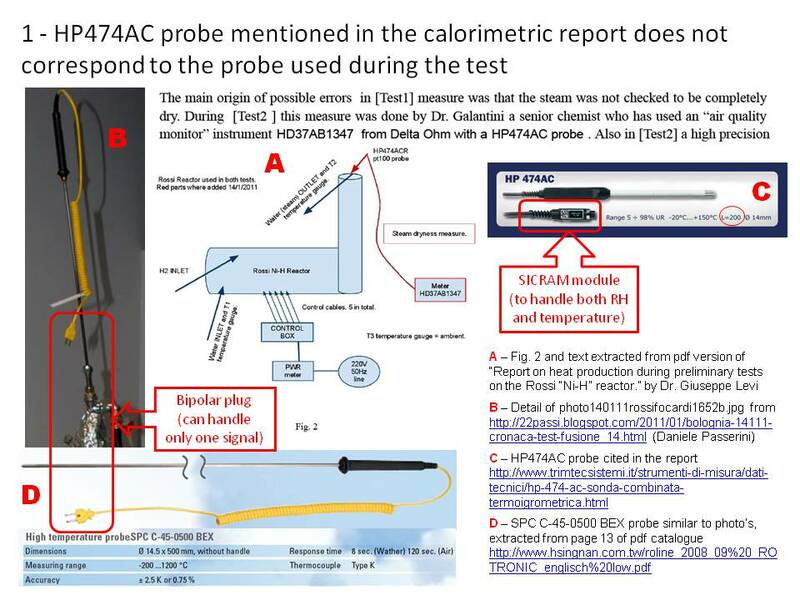 The main issue, for this second flaw (2), is that the value of the maximum flow rate of the pump was not specified in the calorimetric report. This is absolutely not correct for a scientific document and it is highly suspicious. 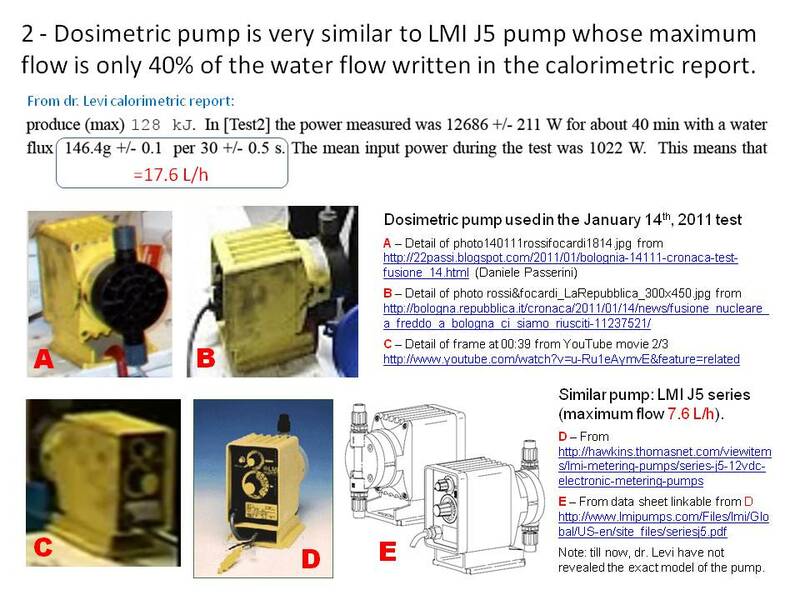 As already explained (2a), the testers were well aware that the water flow declared in the report (17.6 L/h) was higher than the maximum capacity of the pump (12 L/h). Just look at the jpeg (3) and the mentioned video (3a). First, it's something he could falsify and second who know what he was doing at the "lab bench"
He could not falsify it because other people who were with him reported it. Those people know what he was doing at the lab bench. He was making reactor after reactor, often destroying the old ones to reuse the parts, which was a dumb idea. You are referring to Rob/Bob Rohner, whose brother John was just fined by the SEC for fraud. I do not get into the Papp machine story, so why don't you tell us about it? I say "the honest brother", because everyone separates the two that way.